Second, the new policy does not bar individuals who cross the U.S./Mexican border illegally from applying for forms of relief similar to asylum, such as Withholding of Removal and Deferral of Removal under the Convention Against Torture. However, both of these forms of reliefs have significant limitations compared to asylum, such as not providing a path to lawful permanent resident status. Third, the new policy is not retroactive. Therefore, the policy only bars individuals from applying for asylum who entered the country illegally on or after November 9, 2018. Thus, individuals who entered illegally prior to November 9, 2018, may still be eligible to apply for asylum. While the new policy went into effect on November 9, it is unclear if the policy will be found to be legal. Shortly after the President signed the proclamation, several groups, including the American Civil Liberties Union, the Southern Poverty Law Center, and the Center for Constitutional Rights, filed suit in the United States District Court, Northern District Of California (See East Bay Sanctuary Covenant v. Trump). 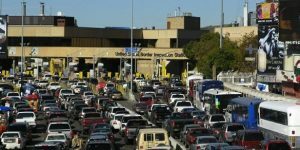 The lawsuit seeks to have the new asylum rule overturned on the basis that it violates the Immigration and National Act, and the Administrative Procedure Act. The lawsuit also seeks an injunction to bar the U.S. from enforcing the proclamation while the case works its way through the courts. Seeking asylum in the United States is a very complicated and time consuming process. While many individuals attempt to obtain asylum without the aid of an immigration attorney, individuals who apply for asylum with the aid of an immigration lawyer have a much higher approval rate than those who attempt to apply on their own. Therefore, if you are someone you know is thinking about applying for asylum, it is highly recommended that you seek the help of an attorney. If you or someone you know is interested in learning more about the asylum process, Hartzman Law Firm is here to help. Our principal attorney, Daniel Hartzman, has helped countless individuals from all over the world obtain asylum in the United States. If you would like information about how Daniel and Hartzman Law Firm can assist you in filing for asylum, please contact Daniel at dhartzman@hartzmanlawfirm.com, or call him at 412-495-9849.